Orange, CA - July 01, 2014 - M S International, Inc. Announces New Kitchen Visualizer Tool for Retailers and Designers. M S International, Inc. (MSI), announces a new, updated version of its popular free Kitchen Visualizer Tool that enables designers and retailers to place the tool on their own website. This tool allows customers to visualize a variety of kitchen product material design combinations. By simply clicking on the countertop flooring, or backsplash of choice, users can quickly have a photo rendered vision of their desired kitchen. This photo rendering can then easily be emailed or shared on social media platforms including Twitter and Facebook. MSI is making their Kitchen Visualizer Tool available to partners to place on their website, to ensure that their customers, and potential customers have access to the this technology. This tool allows users to get a complete overview of their room, allowing for the best choices of flooring, countertops, and backsplashes. This is ideal for both remodels and new construction. Designs in the Kitchen Visualizer can easily expand to encompass other areas of the home or office as well. No training is required to use this program; it is intuitive and allows for immediate deployment on the websites of designers, and retail stores. 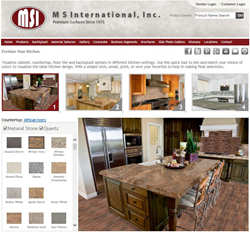 About M S International, Inc.: Founded in 1975, MSI is a leading nationwide distributor of flooring, countertop,decorative mosaics and wall tile, and hardscaping products. Headquartered in Orange, California, MSI also maintains distribution centers across the United States and Canada. MSI's product line includes natural stone products imported from over 36 countries on six continents. In addition, MSI carries an extensive offering of porcelain, ceramic, glass and quartz products. The company maintains an inventory of over 125 million square feet. For more information on MSI, visit msisurfaces.com.